One of the most important rooms in the house, the bathroom, is a space where we spend a lot of time. 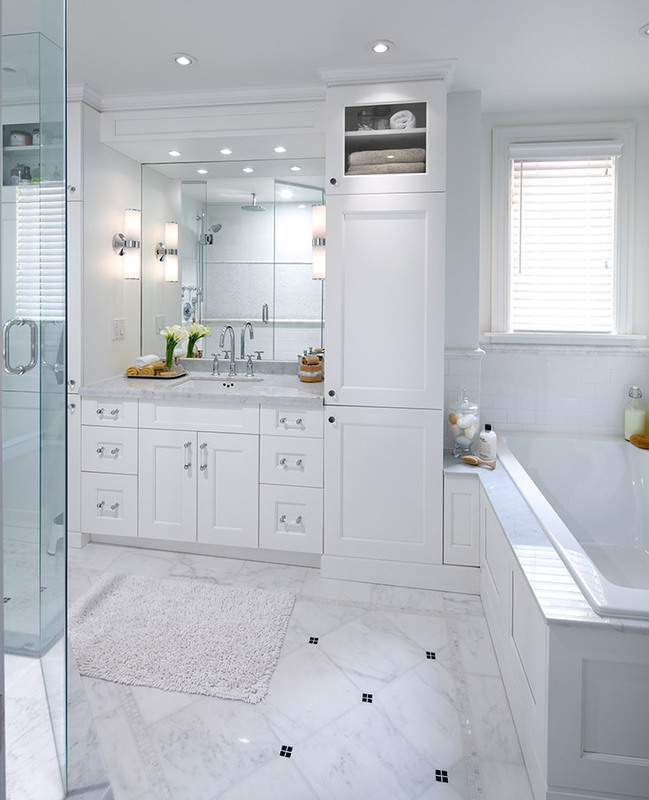 It contributes to our daily life in multiple ways and there are numerous items to consider in bathroom design. Among many, two things matter in the bathroom most. First, it must be well organized. A good floor plan makes it easier to get ready on busy mornings without struggling to find things or clear space for makeup, shaving etc. Secondly, the colour of the bathroom actually matters! For colour savvy homeowners, this is not news, ‎as you already know how colour can make you feel. Here are a few key points about colour in the bathroom that will provide context for my colour choices. If you have an older bathroom with tiles and counters from the 1980s and don’t wish to renovate, think about using a darker neutral colour on the walls like charcoal grey or ‎grey-brown to freshen the room. It may seem strange to add a dark colour, but it creates contrast between the walls and fixtures and this creates visual energy. Select colours that aren’t too intense or really bright. 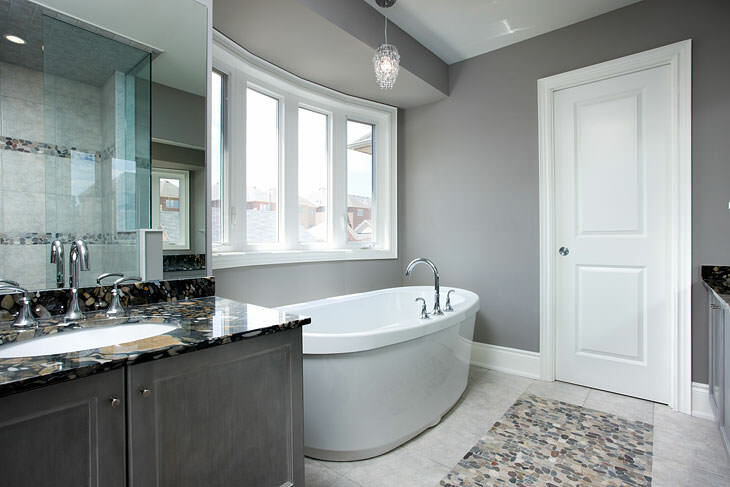 Although a brightly painted bathroom may seem like a good idea initially, it can become a problem due to reflectance. If light bounces off a lime green wall colour, for example, and onto your face, it will reflect onto your skin changing its tone. This can really interfere with how you apply makeup or even how you feel. A word about lighting! The light in the room affects paint colour. Perhaps surprisingly, many homeowners do NOT have enough light in their bathrooms. For the best colour rendering (and for makeup, shaving etc) invest in lighting in the bathroom. Install pot lights in the ceiling, wall mounted fixtures either over or beside the mirror, above the vanity, a shower or tub light and even a lit magnifying mirror. Add light everywhere and put it on dimmers! And of course, not only will you look better, so will your paint colours! Remember that a paint colour in the bathroom becomes your background when you are using the mirror, so select a colour that is neutral and relaxing for you to look at regularly. These are Benjamin Moore hues, but feel free to match them to your brand of choice. This is a spa-like cool green-blue. It is an excellent choice for freshening up gray or beige schemes. This is a pale blue with a hint of purple. It is a great selection for combining with whites, creams or charcoal. This colour is a deep grey with a hint of brown to it. This is a choice I like to add to a space that needs some contrast. It is great with deep cabinets. This colour is a light and soft terra cotta. Definitely a throw back to the 1980s but this is a really flattering colour on most skin tones. Why not look good when you wake up? This colour is a white with a hint of grey to it. This is a nice choice when you want a white room overall, but with a touch of definition between walls and white fixtures. By the way, an eggshell sheen is ok in a bathroom but you can also consider either a specific Bath and Kitchen paint or use a satin/pearl for extra washability.